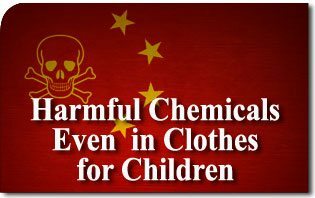 Hazardous chemicals have been detected in clothes for children made in China and sold by big Western brands such as Disney, Burberry and Adidas. This is the verdict rendered by the environmental organization Greenpeace after it submitted 82 items of 12 brands for analysis and found harmful chemicals in every one of them, the French newspaper Libération reported. Among the poisonous clothing items were also products from brands like Nike, American Apparel, C & A and Gap. “Parents looking to buy clothes for their children without hazardous chemicals are faced with a nightmare,” said Greenpeace’s Chih Lee An. The organization has appealed to China, the world’s number one producer of textiles and largest consumer of chemicals to cease using harmful substances in its textile industry. Greenpeace has also published several studies in recent years showing the presence of chemicals that can cause cancer and hormonal disorders in products sold by brands like Zara, Calvin Klein, Levi’s and Li Ning. In 2011, Greenpeace published the reports titled “Dirty Laundry” and “Dirty Laundry 2” showing how suppliers of large textile groups have poisoned the water of Chinese rivers with sewage full of chemicals that were later found in the fibers of commercialized items.